Roofs of houses are not the only surfaces that can be equipped with solar photovoltaic (PV). 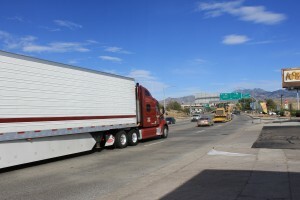 Europe’s largest solar research institute, the Fraunhofer Institute for Solar Energy Systems ISE in Freiburg, Germany and Fraunhofer CSE in Boston plan to integrate solar modules into trucks’ trailers. These modules will power the refrigeration system whether the trucks are traveling or are stopped. As ambient temperature rises with solar irradiation, the solar power supply overlaps with cooling demand, reducing the need for large amounts of storage capacity. The resulting decrease in fuel consumption reduces cost as well as local pollution. A large trailer (approximately 50 m2) could support a solar array of up to 7.5 kW in size. Recent developments regarding solar systems on utility vehicles make use of standard modules or flexible CIGS modules (Copper-Indium-Gallium-Selenide thin-film technology), which are adhesively applied to trucks. To reduce the weight of the modules Fraunhofer ISE has developed and patented a new module design, which integrates the photovoltaic component entirely in the vehicle skin. Without the weight of the front-glass and metal frame, even a 7.5 kW system would weigh less than 300kg (660 lbs). By instrumenting a truck for field measurements of power and temperature, the project aims to generate data on the effectiveness of solar power-based cooling. The results will be used to estimate the value of truck-integrated solar, which will then be presented to potential development partners. Funding is provided by the Zayed Future Energy Prize, which was awarded to Fraunhofer ISE in 2014 (see Fraunhofer ISE’s press release here). The prize represents the vision of the Late Founding Father and President of the United Arab Emirates, Sheikh Zayed bin Sultan al Nahyan, who championed environmental stewardship.